A very interesting report from our team in Pulau Sibu was released today. 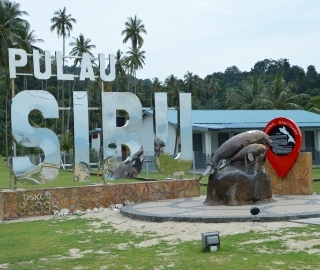 The report is based on in-depth interviews of community members of the island of Pulau Sibu in eastern Malaysia. In the waters off the coast of this island is a sizable population of dugongs that are protected by a gazetted marine park. The locals express some frustrations about the park – particularly the lack of enforcement. -while the park extends 2 nautical miles into the surrounding seas and restricts fishing within this zone, local fisherman only have access to small boats/engines that often cannot travel beyond the boundaries due to rough seas. -the local community is aware of the presence of dugong and hope they bring them economic prosperity from tourism, but remain skeptical. -anecdotally, the local fishermen believe the number of dugongs and extent of seagrass has decreased over the years. Download and read the report by clicking here. This news article relates to the project entitled Operationalizing the Malaysian National Plan of Action for dugongs in Pulau Sibu and Pulau Tinggi, Johor, peninsular Malaysia (MY1).. Click below to learn more about this project.